Frost on blackberry brambles, looking festive. When I came home for Thanksgiving my freshman year of college, it was the first time I really experienced going back home after being away. I had previously gone on family vacations, or a couple of week-long adventures of other kinds and then come home. But moving to college is moving away, and the experience of returning was a very strange one for me. Good and bad both—alienating and welcoming, familiar and strange. My parents had purchased new living room furniture, and either hadn’t told me or I hadn’t gotten the picture. My home looked different. My room looked strangely the same, with the same pictures on the walls and the high school yearbooks lined up on the shelf. And it was BIG. And I had to drive everywhere, and I missed my friends instantly and intensely. And it was so very good to be back. Obviously this was an emotionally messy visit, and a fast one: just a couple of quick days, the visits with family and friends and then the flight home. When I got back to campus I felt the most intense sense of YES, this is right: this is where I live now. And when I walked into the dorms, one of my friends ran up and actually jumped into my arms and wrapped her legs around me. It was so good to be back. And so, after that, I didn’t go back for Thanksgiving anymore. It was too close a turn around for the winter break and finals. The travel was tough, and it was easier to just hunker down and find a "new family" (and part of my extended college community) to take me in for Thanksgivings. I have shared Thanksgiving with the most extraordinary people. Again and again I was invited for the holiday weekend, spent the time surrounded by other people’s communities and participating in their traditions. It’s something quite magical to be welcomed in that way. Thanksgiving comes at a tricky part in the year, when you’re still new and in the process of making decisions about your plans and your studies, and then suddenly you’re called upon by family or strangers to answer to your decisions and your goals. If you don’t have a major yet, or you’re suffering the doubt of pre-finals freakout, well-meaning questions can feel like an interrogation session. The best thing you can do is to make some decisions about your story ahead of time. Decide how you want to answer “what’s your major?” and “how are your classes?” and “what are you going to do with the rest of your life?” Prepare particularly if you are majoring in something that doesn’t translate into an obvious career path—your family (or your friends’ family who have taken you in) will understand if you say “computer science,” but they will have more questions if you say “philosophy” or “comparative literature.” Go ahead and decide how you want to explain your experience. Then enjoy the chance to talk about yourself a bit. Maybe don’t mention the crushing doubts or the fact that you’re terrified of the first essay that you turned in last Friday and haven’t seen a grade for yet. Talk about the material. Talk about your professors. Talk about what you find interesting with what you’re doing. And remember the point of the holiday. Celebrate yourself and your experiences so far. Allow yourself to be extraordinarily grateful. Eat some amazing food and lay around the house for a bit. Relax. And also, enjoy being part of a holiday that is celebrated across the country with very little distinction in religion or ideology. It’s a holiday that’s about food and togetherness, which is something everyone can appreciate. Holidays far from home can be confusing. 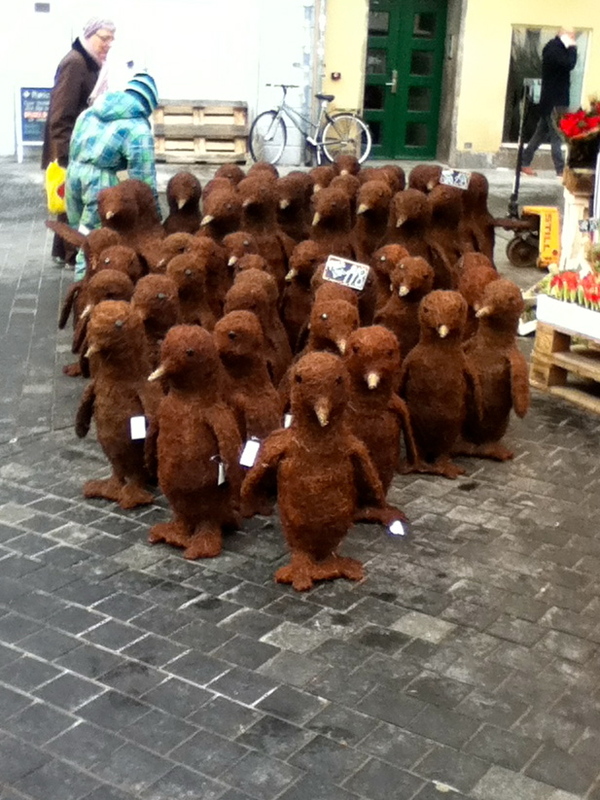 For example: these inexplicable Christmas penguins, as seen in Copenhagen last year. I’ve also learned to love it all the more since moving abroad. No one “gets” Thanksgiving in Europe. I have a whole new appreciation for the holiday. Whether you spend it with your family or you gather with friends or get “adopted” by some friends’ family, it’s a lovely chance to just be present and relaxed and happy. Take a day or two without the books. Drink lots of tea and wear sweaters. Share stories and compare plans, watch the sports if you’re into that and try not to get trampled by rival shoppers. Relax. The winter break is coming up but there’s a lot of work between now and then. Call home. Whatever home you’re away from for Thanksgiving, call. Call your folks, call your grandparents, call your friends. Let the people you love know that you love them. And then relax and take some naps. That’s honestly my favorite part of any Thanksgiving tradition. Enjoy the weekend, wherever you happen to be! What are your best Thanksgiving traditions? What makes the holiday special for you? Maybe share some things you’re thankful for in the comments section as well. Take care, everyone!